or They Shoulda Been Clogs! Another one of my online computer friends is Beth in Minnesota. As part of our online wierdness and personas, we often have "trademark" sayings or situations that spotlight us. One of Beth's trademarked items is clogs. Her online persona hops on tables and clogs her way out the door when it's time for her to log off. I had been looking for a clog design to make her something, but evidently clogs weren't in fashion, as I sure couldn't find any ready-made design. Since I'm not particularly artistic and designing something that actually looks good is quite beyond my meager talents, I really need to find a ready-made design/pattern. 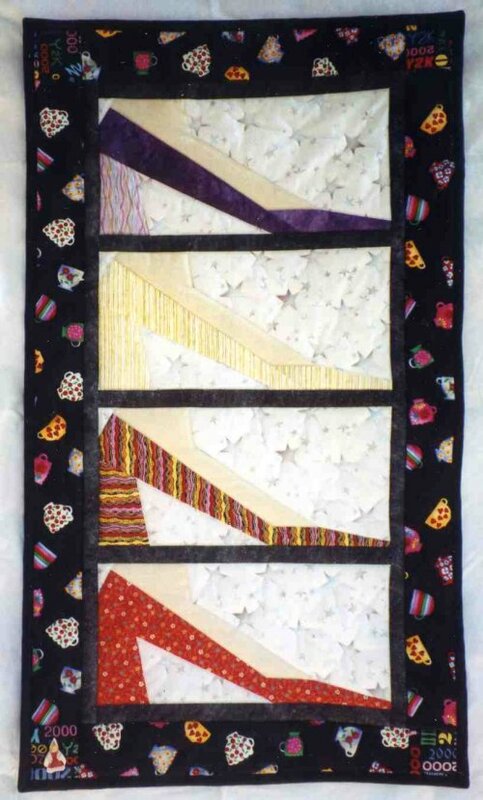 So it was with a qualified delight that I discovered "Watch Your Step", a wall-hanging designed by Julie Lynch, at a quilt show. It contains 3 delightful wall hangings with different kinds of high-heel shoes, but I thought the low-heeled shoes could be reasonably substituted for the real clogs. The only freedom I took with the pattern was to eliminate the strap across the instep, so that instead of a Mary Jane-type shoe, it was more of a standard pump. 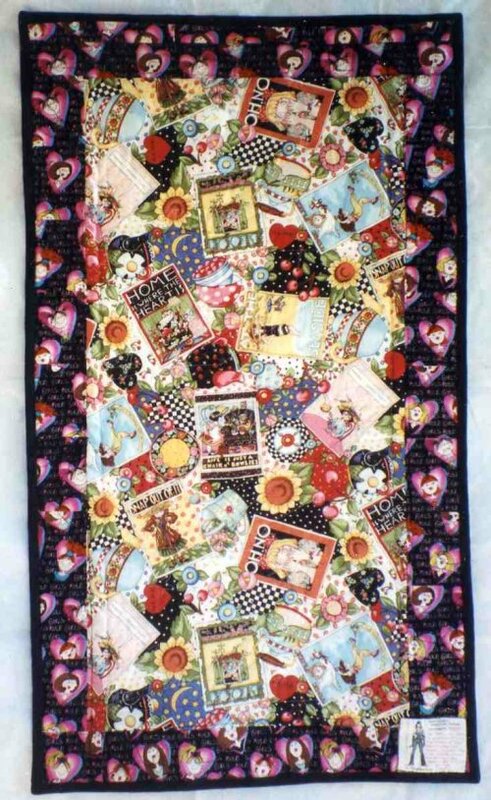 The back of the wall-hanging features a Mary Englebreit print which has the graphic and phrase "Princess of Quite A Lot" on it. The pattern, "Watch Your Step" is available thru Mary Lou & Company. The pattern is not listed on their website, so you need to click on the "contact" link and make a request. Mary Lou assures me that if requests for the pattern are received, they are passed along to Julie. While you're there, you might also check out the patterns that *are* available on Mary Lou's site .. she has some darling chicken patterns!